Learn how you’ll gain the agility for accelerating IT delivery, the efficiency to improve OpEx and CapEx, the flexibility to leverage private or public cloud resources, and the level of control necessary to meet governance and security requirements. In order to keep pace with the business and developer demands inherent with the digital era, enterprise IT has picked up speed and scale by embracing the cloud. As a result of this mix of private on-premises clouds, hosted private clouds, and public cloud services, the modern data center has become a more complex and murky environment to manage. 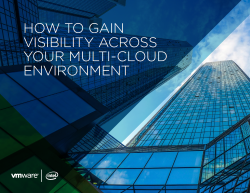 In the VMware eBook “How to Gain Visibility Across Your Multi-Cloud Environment,” we explore the power of the enterprise-ready cloud management platform (CMP) as a single solution for automating the delivery of IT resources, and managing those resources throughout their lifecycle across private and public clouds.